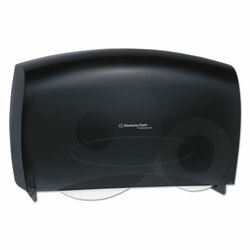 The Kimberly Clark Professional Combo Unit Toilet Paper Dispenser (in Black / Smoke) is a great choice when you need an efficient, modern toilet paper dispenser. It can be used with two JRT Jr. Rolls (two full 9.38” diameter) OR one JRT Sr. Roll (13” diameter) and a stub roll. All rolls have a 3.8” width and a 3.25” diameter core. With two full JRT Jr. Rolls, it holds more than the equivalent length of ten standard rolls and the ability to finish the stub roll means you're not wasting valuable toilet paper. The design can help minimize run out, waste and maintenance time. When properly installed, these dispensers meet the ADA Standards for Accessible Design. It features a hinged front cover, tear-off bars on sides and front of dispenser opening and a push button for easy opening or a common key lock to reduce pilferage. The system is compatible with top bath tissue brands, including Scott and Cottonelle Brands. Gray/Smoke Jumbo Roll Toilet Paper Dispensers from Kimberly-Clark! 804 In Stock today.